“You’re very blessed to worship in this Shrine. I say that not because you get to look and listen to me . . . you can make up your own mind about that . . . but rather because not only does the beauty of this Shrine lift our hearts and souls to contemplation of the things of God, but because the very walls preach to us. 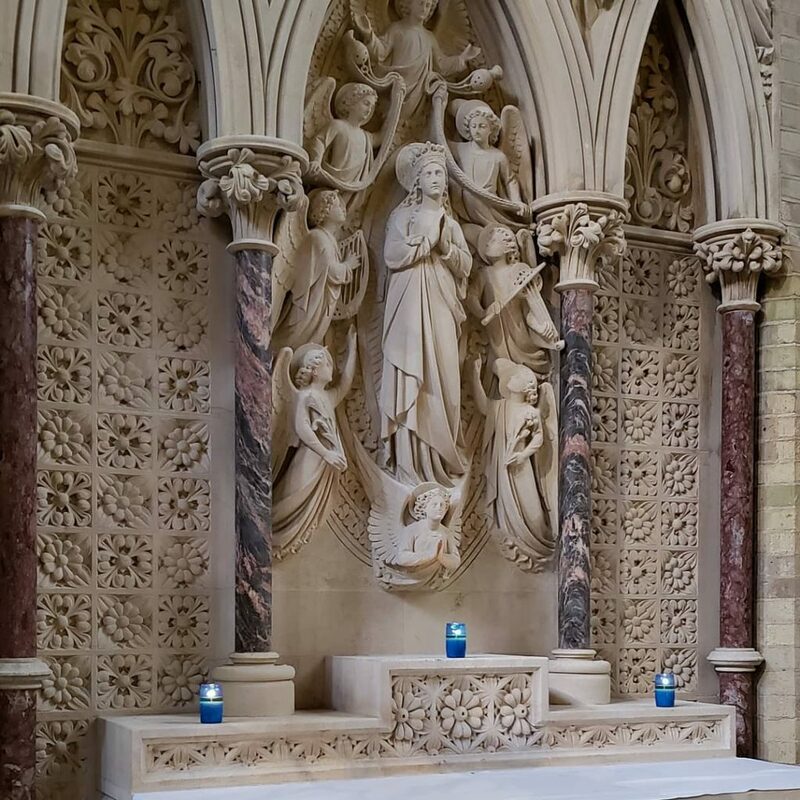 As I sat in the Chapel of the Assumption last night praying for some inspiration for this homily, I felt that what I contemplated before me was a homily in stone. One of the first things that might strike you if you were to walk round the chapels of the glorious mysteries in their proper order is how similar this Chapel of the Assumption is to that of the Ascension only two chapels further down. However, there are differences and they are important ones. The most crucial difference is that when we look at Jesus in the Ascension he rises unassisted whereas Mary is surrounded by angels bearing her on up to heaven. We speak of Jesus ascending, but Mary being assumed. Mary does not ascend to heaven by virtue of her own power: she is the most perfect of creatures, yet she is not divine. Jesus is the way, He paves the way for our eternal happiness in heaven, but Mary is the perfect disciple. She of all created men and women shows us most perfectly what to follow the way of Christ looks like. And what Mary shows us is a life that points to Christ, a life that looks to the strength of the Lord, a life open to the will of God, a life that trusts that God seeks to work great things through us. We see this in the Gospel this evening. Elizabeth showers Mary with praises and calls her blessed. And what we see from Mary is true humility and true magnamity. She does not deny what Elizabeth says to her, for she is truly blessed among women, not does she seek to run from the greatness which God is calling her to. No she acknowledges all this but in doing so she turns it into a beautiful hymn of praise to God and to all that He works in His creation. We see in the Magnificat that the greatness of Mary can never be separated from the greatness of God: she cannot carry out her work alone, but nor does God intend to do His work of redemption apart from her or in spite of her. Mary’s life might be characterised as one complete and continous ‘yes’ to God, and this is what we’re called to, there is no other sure path to heaven. If we turn back to the chapel of the Assumption, if you’re not familiar with it you’ll note that underneath the altar the apostles are gathered round an empty tomb. Mary’s yes shows us the glory of life beyond the tomb, the eternal life that we’re called to, but each time we say no to God we choose the tomb over the glory opened up for us. Saying ‘yes’ to God with our whole lives is rarely easy, but it is always worth it. We know that we cannot make that yes alone and we know that at times the magnitude of what is asked of us can seem impossibly daunting. But this is when we turn to Mary, we ask for the intercession of one who knows the cost of the yes, but also its beauty.